Almost everyone has heard of cashmere. It’s traditionally been associated with other high end luxury goods, like silk and gold jewelry. What isn’t widely known, and I’m hoping this will change, is that the best cashmere in the world comes from Mongolia. Cashmere is superfine angora goat wool. But the goats are pretty special, given that they can tolerate winter temperatures down to -40F. 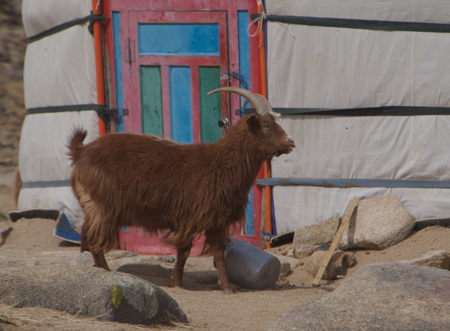 I’ve seen the goats mostly at Ikh Nartiin Chuluu Nature Reserve and found them quirky and fun to watch. As you will see, they come in all shapes, sizes, colors and horn “designs”. But the undercoat is the same on all of them, so the rest doesn’t matter. 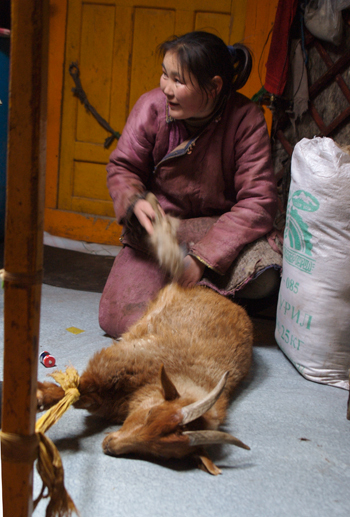 While there are businesses in Mongolia that take the raw cashmere and turn it into a finished product, most of the wool is purchased by the Chinese and taken back to China. 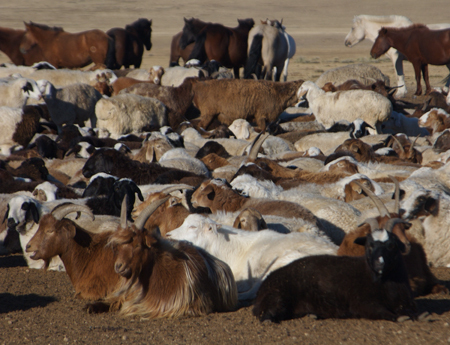 Our Earthwatch group got to visit Gobi Cashmere in Ulaanbaatar. I brought home a wonderful natural color cashmere neck scarf that is as soft as can be. But here’s where it starts, with each goat being hand-combed in the spring. Other than the 30 minutes or so they are constrained for combing, they wander free in the countryside, adding a little character and humor to the landscape. I took this photo on my first visit to a herder’s ger just outside Hustai National Park. 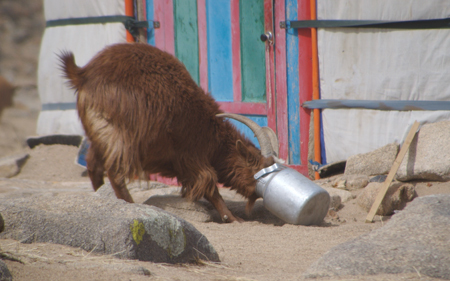 A “pinto” goat at Ikh Nart. 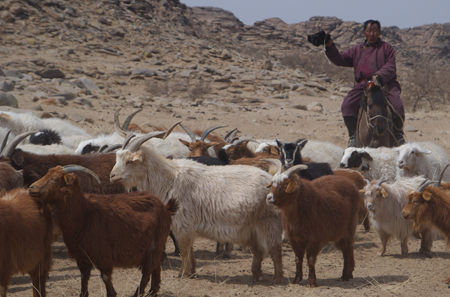 Goats and other livestock being herded through the research camp at Ikh Nart where they had been brought for watering. There’s one in every crowd. This one just…had…to…see what was in the can. 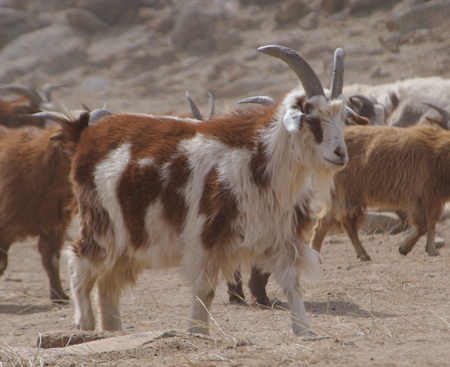 These goats are part of a large two ger establishment near the Tuul Gol (river) just outside of Hustai National Park. Answer to Friday’s question: Roses. Vintage Gardens in Sebastopol, California was having an end of season sale of roses that they might be discontinuing, so I’ve ordered a bunch that looked interesting to help preserve them. Most I’ve never heard of before.